To continue to compete with the likes of Google Drive, OneDrive and iCloud, Dropbox really needs an online office suite to call its own—so it's borrowed Microsoft's. You can now edit any .docx, .xlsx or .pptx file from right inside the Dropbox web interface, with no extra software required, and here's how to go about it. It's a smart move from Dropbox, made as part of its ongoing partnership with the Redmond firm. In fact all you're getting is a seamless link over to the online Office apps that Microsoft has developed as part of OneDrive, but everything is handled slickly and from within Dropbox's web portal once you're logged in. 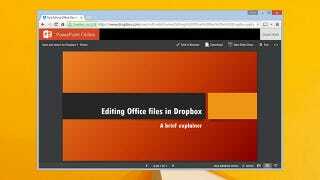 Just click on any Office-compatible file in your Dropbox locker on the web to get started. In the top right-hand corner is a new option labelled Open: Click here to be whisked away to the relevant Microsoft app. These apps are cut-down versions of the desktop tools, so not all of the features and layout options are present, but at least you can correct a typo or two. You could do the same thing from the OneDrive end but everything is seamlessly packaged inside Dropbox's online app and changes are automatically synced back once you close the file. It's particularly useful if you're working on the go—on a Chromebook for example—and you need to make a few quick edits without the desktop software. You don't need a premium subscription to Dropbox or an Office subscription to use these tools.